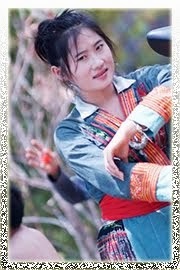 In Vietnam, the Hmong people are one of the largest ethnic minorities (around 900,000 people). They are principally concentrated in the mountainous north of the country and usually live at high altitudes. Different ethnic categories co-exist and can easily be identified by the way they dress and their traditions. The Black Hmongs are best known for their handicraft and their traditional indigo blue dress. Flower Hmongs, on the other hand, wear colorful clothes, and it is not difficult to find them during market days. 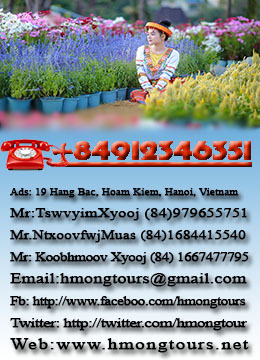 Nowadays, Hmong hotspots such as Sapa are becoming large tourist attractions. On market days, the town is completely crowded with Western people looking for handicraft works, the exotic and all things genuine – although Sapa remains completely empty during the week. A new form of income has appeared which is transforming the Hmong people’s way of life and ancestral traditions little by little. Known in China as Miao, which is a term to define all the different ethnic minorities, Hmong people mainly come from southern China. They had to flee from there during the Ming and Qing dynasties, after they rebelled against Chinese imperialism 300 hundred years ago. They eventually found asylum in Thailand, Laos and Vietnam. The Hmong history remains difficult to trace because their tradition is an oral one, but they are still identified as Hmong, thanks to their language, traditions and way of life, which they have succeeded in preserving. Even if some Hmong people have traded their traditional clothes to get Western attire, they definitely understood that opportunities for a new market economy were offered to them. In Sapa, the market is crowded every weekend with Western tourists surrounding themselves with as many traditional Hmong people as possible! Silver jewellery and handicraft works are a great success among the tourists. For the Hmong this is also a way to promote their culture and discover their traditions. However, tourism has had a strong impact on their culture and does disrupt their traditions. Traditionally, the man and husband’s duties consist in looking after the entire family, taking the main decisions and responsibilities concerning the safety and welfare of the family. As far as they are concerned, women have to play the perfect housewives, taking care of their children and preparing and cooking meals. The handicraft work, like making handmade traditional clothes, is also a part of their job. However, important changes in this traditional structure have been observed recently, mainly since the intrusion of tourists in North Vietnam. Being the money provider had always been the husband’s role. This is not always the case anymore. At Sapa market, which is the biggest Hmong hotspot in North Vietnam, the place is crowded with dozens of Flower Hmong women selling their jewellery and patchworks with which to trap Western tourists. The scene is, in fact, quite funny. Thanks to this new form of income, Hmong people have been diversifying their traditional way of life. For ages, Hmong people subsisted with their harvests, mainly thanks to the culture of rice. Along the road, tourists can see small wood houses surrounded by fields for terrace cultivation. Here, there is no electricity or water access either; everything is archaic and simple. From their buses, some tourists might think that these landscapes are the exact definition of paradise. The place is wonderful and quiet, surrounded by Vietnamese mountains, lost between the fields. It is indeed truly awesome. years ago and now she has to provide for the entire family by herself. This is an example of how difficult life has sometimes become for them. It also reflects how brutal the social changes have been in a short period of time. Hmong people have always been known to be good at adapting while preserving their way of life, but the Western intrusion has created new needs and new habits. Vietnam, which is still a communist country, opened its door to tourism a while ago, and even if North Vietnam remains quite traditional in comparison with the south, times are definitely changing faster than the time it takes to realise it.